You are here: Home / Food & Rum / What do M*A*S*H and Rum Cake have in common? What do M*A*S*H and Rum Cake have in common? You’re probably wondering what a TV series about an army doctor and his band of sidekicks and a rum cake have to do with each other. Well… as far as the show goes, not a lot. 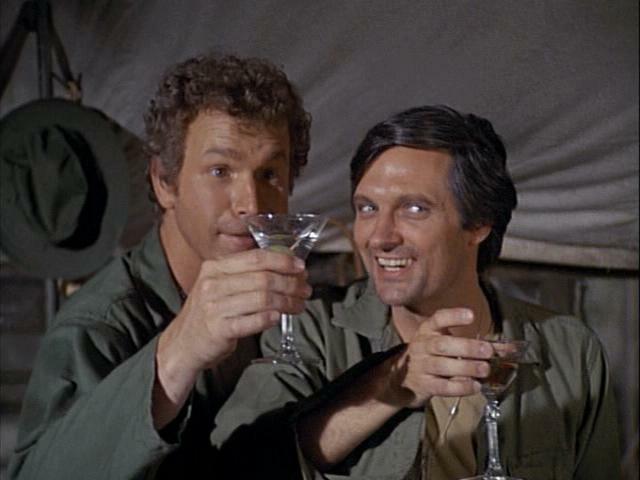 But as the main star of the show, Alan Alda who played Dr. Hawkeye Pierce in the iconic television series “M*A*S*H explains, he met his wife of 58 years, the love of his life Arlene when a rum cake was dropped on the floor of a party they were at and they both leapt in with spoons to eat it, taking the 3 second rule to a whole new level in the process. Preheat oven to 325 F / 160 C. Grease and flour 10 inch / 25cm tube pan or 12 cup cupcake baking pan. Sprinkle nuts over bottom of pan. Combine all ingredients together and pour over nuts. Bake for 1 hour and allow to cool. Turn upside down onto a serving plate. Drizzle the glaze evenly over top and sides of your rum cake. Allow the cake to absorb glaze. Repeat until all glaze is used. Dust with powdered sugar to make it pretty. Melt the butter in a saucepan. Stir in water and sugar. Boil 5 minutes, stirring constantly. Remove from heat and stir in the dark rum.